Cancer June 2015 Horoscope predicts that your focus will deviate from career and profession to family and personal matters. Relationships with friends and loved ones might need a little bit of diplomacy. Your personal ambitions and aggression will dominate in June 2015. You can dictate the path of your progress. Others will end up following you and help you achieve your objectives. This month is suitable for the Cancerians for a serious examination of your goals in life and making necessary changes. You have to form new strategies and make your life secure for the future. The June 2015 Cancer astrology predictions forecast that your career will undergo major transformations during the month. This may involve a change of your job profile in the same organization or a shift to another company. You have to learn new skills or improve present abilities by higher education. New businesses will prosper during this time. Find out how July 2015 will turn out for you. Till 21st, planets will help you in attaining your financial goals and after that personal effort will be necessary. Money flow will be splendid and risky investments will be profitable in June 2015 for the Cancer zodiac sign. Single Crabs will have many chances to get into romantic alliances as love is chasing them. This is the month to find out what your partner wants from you in a relationship. Love compatibility with your partner or spouse will be harmonious. 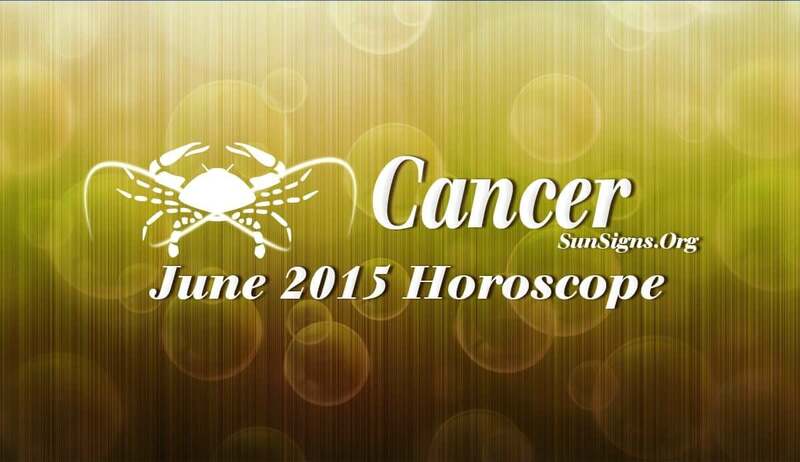 The June 2015 Cancer monthly horoscope forecasts, that your health will be excellent for the time being. But you have to take precautions like practicing mindfulness to maintain your well-being in the coming months. Take a look at your medical horoscope to know more.